« Can pessimism be comforting? Number form synesthesia or: why is there a kink at 20? You will note several interesting features of this mental map. 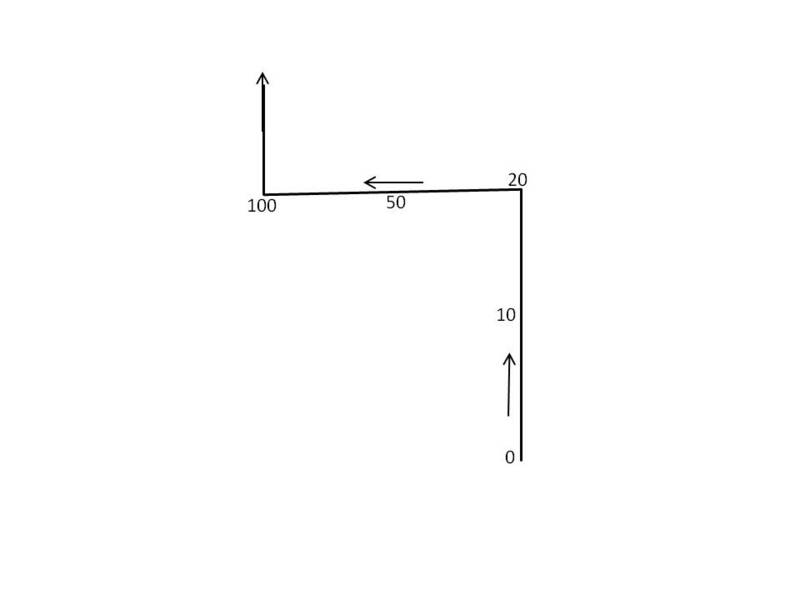 Firstly, there is always a 90° left turn at the number 20; there is always a 90° right turn at the number 100. These two kinks are the only kinks in my mental number line; the lines are perfectly straight before zero and after 100. Why the kinks are there is mysterious. You will note that this mental image is similar to the previous one, but rotated 90° to the right. The scale is also warped: not only in the location of 50 yrs., but in the location of 10 yrs. I believe this stems from my childhood belief that the years from age 10 to age 20 would seem to last longer than the years from 0 to 10. Why childhood? Well, I’ve had such mental images for as long as I can remember; it follows that they were first “constructed” in my brain at an early age. 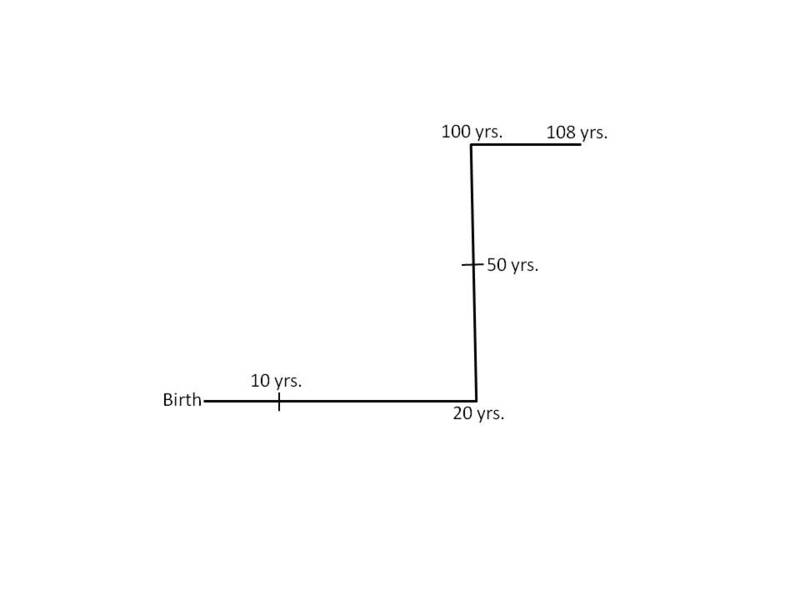 And there is a sort of logic to the idea that 10-20 lasts “longer” than 0-10. After all, we don’t normally recall anything about our first 5 years or so; to a child, it’s almost as if you missed those years. So if I am 10 years old, say, and looking back at my life so far, it won’t seem nearly as long as the decade looming in front of me. (I must stress that I am not a neuroscientist and that this is all pure speculation.) As for why 50 is half-way between 20 and 100, I can only conclude that I wasn’t so good at calculating averages when I was younger. The similarity of the two mental maps is best explained by positing that one of the maps is derived from the other, although which came first I cannot say. I only became aware very, very recently that there is a name for this phenomenon. These maps I make are called “number forms” and they are a form of synesthesia. I have a friend who experiences grapheme-color synesthesia, seeing letters and numbers as if they had very specific colors. It never occurred to me that my mental number maps were a related phenomenon in any way. The order is always counterclockwise. Strangely, the months are not quite evenly distributed: July is always at the top, but December/January are level at the bottom, with the (strange) consequence that there is one more month in the first “half” of the year than the second. I also mentally divide the year into three partitions, starting at Sept. 1, Jan. 1, and June 1. I am confident that this partitioning is a product of having attended school (on a semester system) for 25 years of my life. This is how I picture the recent history of the world, from the late 1700’s to the present. There are four kinks: at 1800, 1900, 1950, and 2000. The three biggest wars (to an American, at least) are marked in red; 1968 is also clearly “labeled” in my mental map (obviously because it’s the year of my birth). Again, there is a lack of scale: 1800-1900 takes up as much “space” as 1900-1950. One might conclude that I regard the 20th century as more “important” than the 19th, since I relegate more space to the former. But there is a simpler explanation. I can still vividly recall a timeline of history that I saw, perhaps in the 3rd or 4th grade, that has the exact same topology as this last mental map of mine. 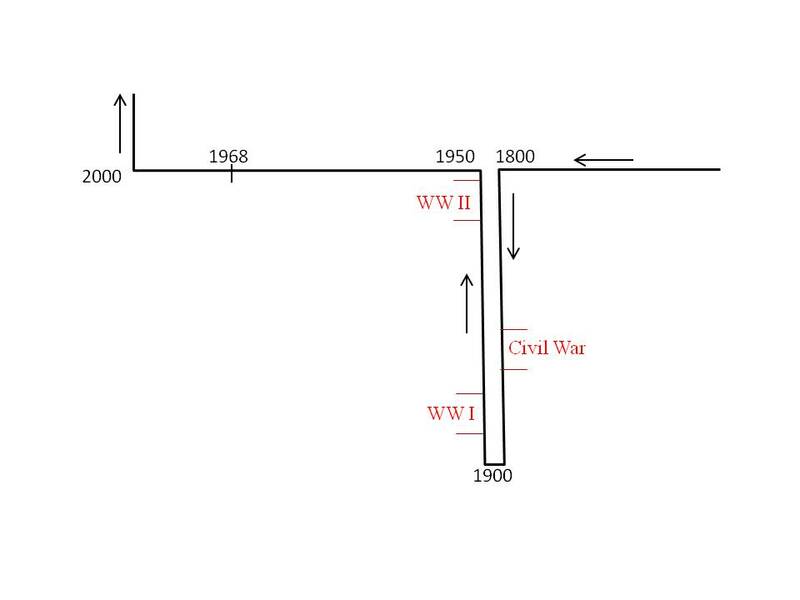 The years from 1800 to 1970 (or so) were graphically depicted in a timeline; there were folds at 1900 and 1950, simply to make the timeline fit on the printed page. Above key years (such as 1939) were cartoonish drawings of world events, such as World War II or Man Lands on the Moon. Beyond the 1970’s there was nothing. I wish I could find this image, which I believe in some sense “triggered” this form of synesthesia; I want to say that the image was in a World Book Encyclopedia but I have no proof of this claim. In any case, I think other forms of synesthesia may also be linked to the way we first learn certain things. My friend (who sees colors for every letter of the alphabet) once told me the probable origin of his synesthesia. He first learned letters and numbers through colored refrigerator magnets; the colors and letters became inextricably tied in his mind, and the connections exist to this day. For any real neuroscientists out there, I believe this is a fruitful area for further research. Anyway, I’d be curious to see how many other people experience “number forms”. It doesn’t make you crazy. After all, Sir Francis Galton called his book on the subject The Visions of Sane Persons. Interesting. I have always been good at mental math. At one company I worked for several years ago they sometimes called me “Rain Man.” (This was an exaggeration, I assure you). But I never have experienced anything like the mental map you describe. Mark “Rain Man” – somehow I knew it! I don’t have a mental map for numbers either. For both the calendar and history maps, my mental image is a horizontal line going from left to right. Maybe it is an imprint from 3rd grade, but it seems odd (to me at least) that your history timeline goes from right to left. For some reason, it seems peculiar that your calendar map runs counter-clockwise. I have no idea why this seems unusual to me. I think that both of our limitations with chess are that we think too mathematically, rather than “artistically.” Your maps are definitely more artsy than anything my linear mind conjures, though, lol. Wow – I did not know that you could visualize numbers like this! I have read that Feynman was a synesthesist. Concluding from the statistically irrelevant sample of n=2 it seems to common among physicists. Unfortunately, I don’t “see” numbers at all. While I had done some reading on the color-number/letter form of synesthesia, I hadn’t read Francis Galton’s other work on number forms, “Visualized Numerals,” until your essay started me looking. In there, there’s an example of a number form that is almost disconcertingly like mine – it starts like a clock for the first twelve digits, and then forms a periodic wave with a crest every ten digits. I also agree that these associations are connected to early physical visuals that we have while learning numbers and letters. In my case, clocks and colored refrigerator magnets. Interesting. I wonder how many people try to wish themselves to be synesthetes. The Wikipedia link you provided implied that most cases are genetic and not acquired (ie from colored refrigerator magnets). I think it is possible to self acquire mental ‘tricks’ that help organize thoughts and store large amounts of information. For example, medical students frequently use mental pictures (visual) in combination with rhymes (auditory), acronyms and kinesthetic tricks as of mneumonic devices to retain volumes of material during training. Would it not be possible for someone to internalize these over time a and incorrectly deduce she is someone born with synesthetic talents? Personally, I do not think I have the inherited version of synesthesia….but I do visualize the year exactly as Matthew does (albeit mine is clockwise). I also mentally compress historical timelines based on learned material (boring periods tend to be very shortened and interesitng periods long and rich). I found your blog after just discovering a name for my number thing – your time map looks incredibly familiar to me. Wow. If our images have the same source, then you may be similar to me in age? I am 44. I always thought people saw the year as it appears in my head. When I imagine numbers normally it looks most like the mental map you have when you imagine someone’s age. From 1-10 it moves horizontally from left to right, then at 10 it moves vertically up to 20 where it turns back again to the left. Then from 20 on to 100 all the decades are stacked upward. At 100 there are minor differences to before but it basically starts over. So I see major kinks at 20 and 100 as well. I wonder if this has to do with the names of the numbers. Until you get to 20 each word has it’s own name (one, two, three, even seventeen, eighteen, nineteen), but at twenty and onward the names start repeating (twenty-one, twenty-two, etc.). Hello 🙂 I was very interested in your calendar – mine is similarly skewed and anti-clockwise. Is your birthday in July by any chance? I have always assumed that I put July at the top and December at the bottom (making spring months rather squished and autumn months rather long!) because when I formed this map as a young child, my birthday in July and Christmas were milestones in my year! So I’d be interested to hear when your birthday is. Hello:) it’s very nice to finally find someone that sees time and numbers in a way that is so similar to the way I see them! I just recently discovered that how I see years, numbers and months is not how everyone else sees them. 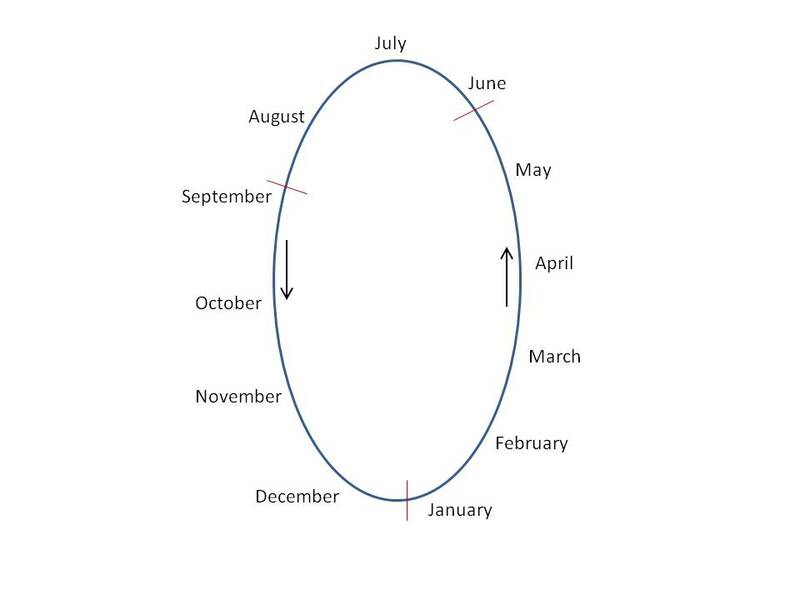 My yearly calendar is also an oval but I always see it from the month of January (I think because I was born in January) and when I think about one month I see myself travelling on this oval from January to whatever month it is I am thinking about. I’m quite lazy because, depending on which way is fastest, I could be travelling clockwise or counter clockwise from January 😛 And finally someone who sees history from right to left! all the other maps I saw posted on other blogs started from left to right and it bugged me so much that I wanted to take those pictures and flip them so that they’re correct :))) my year map is waaaay more winding and on a dark green-greyish background. also, because I got married in oct 2010, when I think about 2010 I see it overlapped with the oval calendar sitting snuggly over the month of october 😀 thank you very much for this post, it has brought me a whole lot of comfort! Does anyone sees numbers (patterns) moving constantly forward in front of us? I jump on them..